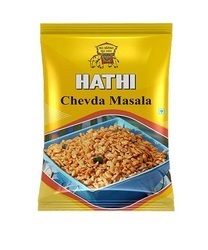 Packaging Size Available: 50 gm, 100 gm, 200 gm, 500 gm, and 1 kg in plastic containers. Chivda is a crispy, crunchy all time favourite Indian snacks, which can be easily prepared at home. Chivda has been traditionally more popular and regularly prepared during festivals, but as of today it has become one of the favourite Indian munchies. Chivda can be readily purchased and also can be easily prepared using rice flakes or puffed grains, nuts, dry coconut, oil and Chivda Masala. Our firm is indulged in offering Chivda Masala to the customers. With the firm commitment to the quality, we are manufacturing and supplying a wide range of Chivda Masala. Used for prepare the chivda to add a spicy and delicious taste. An important fast food product of Gujrat, our Chivda Masala is appreciated all over India for its spicy and unique taste. Apart from this, one can also this masala to make several other dishes. Known for its superior quality, we make sure to deliver this masala at the clients' end within the stipulated time frame. A perfect blend of some pure spices, this is certainly the most detailed blend in the Mahalaxmi Collection. This blend is evenly balanced for taste and flavour and spreads a rare character to Chevda. From our extensive compilation of range, we provide Masala Chivda to our patrons. We offer them at reasonable price.